In this modern world where we live in and in where we often do not have the time to take a minute off in our day to day life, we recurrently get involved in a fatiguing routine which makes us feel like that mouse mounted on an eternal turning wheel where there is no possibility of escape. The rhythm can frequently become frenetic and in some stages of our life, problems get crowded and stress dominates our lives, leading us many times to a lack of sleep and medical issues. But this stress is actually blocking the flow of creativity that may well deliver the ideas towards those solutions. We are simply being victims of an accelerated movement in our brain which is none other than what we call thoughts. The amount of “noise” or automatic thoughts generated in mental patterns is such that it is said that we can have over 60,000 thoughts a day. Just take a moment to go into your mind and discover if you can have as many thoughts a day. Where do you think they come from? The reality is that the majority of these thoughts have a “time-based initial trigger”: our past experience generates thoughts in the form of memories in which we may spend hours revising their content; the fear of the future creates thoughts of hypothetical forthcoming situations and, in many occasions, of meaningless worry. The amount of energy, time and of space consumed within our mind is such, that they block any sort of potential creative thoughts based on the present moment. Techniques such as meditation, implemented in many schools now since early age, help us perceive that we can become mere spectators of our thoughts. It is precisely that distance with respect of the thoughts where a free space of non-judgment is developed, leaving a door open for releasing potential creativity. For example, divergent thinking, which is the ability to give the greatest number of answers to a question. 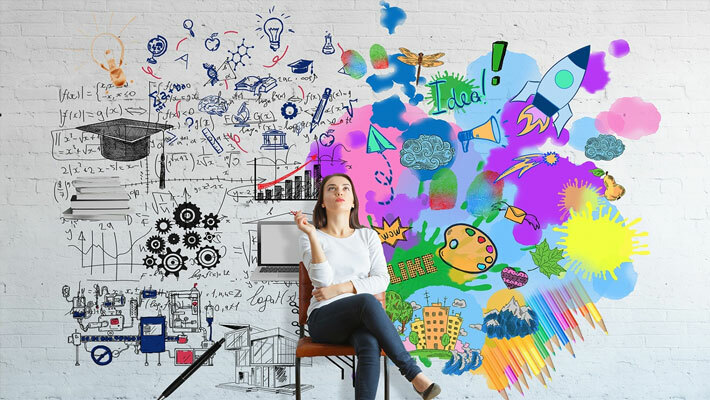 Another example of a technique of promotion of creativity, which is mostly used in marketing and advertising companies, is that of brainstorming. It is not a coincidence that one of their few guidelines, but key, is to carry it out in an environment free of criticism. This technique promotes a context where basic brain functions such as analysis is cancelled or switched off. Ideas are not criticized or analyzed, but a space is created where they all have a place.